Pruning a nectarine is an important part of taking care of the tree. There are a number of reasons for cutting back a nectarine tree each with a specific purpose. Learning when and how to prune nectarine trees along with providing irrigation, pest and disease management and proper fertilization, will ensure a long life for the tree and a bountiful harvest for the grower. Most fruit trees are pruned during the dormant season – or winter. Nectarines are the exception. They should be pruned in late early spring to allow for an accurate assessment of flower to bud survival prior to pruning. Pruning and training a nectarine should begin the year of planting and each year thereafter to develop a strong well-balanced framework of scaffolds. The goal when cutting back a nectarine tree is to control its size to make it easier to maintain and to pick fruit. Pruning also helps develop a strong limb structure and opens up the tree so sunlight can penetrate the canopy. It is also important to remove any excess fruitwood, encourage budding and to remove any dead, broken or crossed branches. 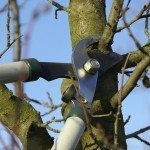 There are several methods to pruning fruit trees. The preferred method for nectarines is the open-center system, which opens the tree up to sunlight and fosters maximum yields with the best quality fruit. The goal is to create a tree with a strong trunk and well positioned side branches along with maintaining a balance between vegetative growth and fruit production. Once you have planted the tree, prune it back to around 26-30 inches (66-76 cm.) in height. Cut off all the side branches to leave a shoot without any lateral branches that is 26-30 (66-76 cm.) inches tall. This is called pruning to a whip, and yes, it looks drastic, but it creates the best shaped open center tree. In the first year, remove any diseased, broken or low hanging limbs as well as any upright shoots that develop on the main scaffold. In the second and third years, again remove any diseased, broken or low hanging branches as well as any upright shoots developing on the inside of the tree. 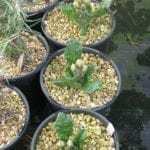 Leave smaller shoots for fruit production. Prune the vigorous upright branches on the scaffolds by cutting them back to an outward growing shoot. Continue annually along these lines, cutting back low hanging, broken and dead limbs first, followed by the upright shoots along the scaffolds. Finish by lowering the height of the tree by pruning the scaffolds to an outward growing shoot at the height desired.